I can see the looks on the faces of Mario, Louis, Sindy & Cristena when they step through the door of Kelmare’s home and into such a large and comfortable living area! I decided that tonight I would cut out a small snippet of what I wrote and hope that you will enjoy it. It is very rough right now and won’t be reworked and polished until after I complete it. I do hope your words are kind, but should they not be, write them anyway. I have heard some very crude comments about my style and I must say that it only makes me stronger! Live With Passion! “Well Louis, I am happy to say that what you see is only the beginning !” noted Kelmare. Kelmare turned the old and creaky knob and pushed the door open. Mario, Louis, Sindy & Cristena stepped inside and could not believe their own eyes! Before them was a dwelling that appeared to be three or four times the size of what they had thought. Overhead, the roots of the trees had made a beautiful, water tight ceiling of arches and channels, like nothing that the children had ever seen before. Their was a warm, crackling fire coming from the old, cobble stone fireplace on the right wall that placed the entire area at the perfect room temperature. At the far end was a copper sink with water inside, soaking some dishes. On the left wall was a large bed that rested on an antique rail frame and was covered with a beautiful checkered quilt. An old hardwood floor covered the entire area with a large rug in the center. All in all, this was a very cozy living for being in the middle of a forest. 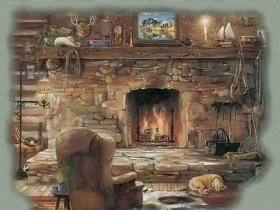 “This place is beautiful,” Sindy said, stepping into the center of the room and watching the fire sparkle and pop. “Oh dear me, this is just a modest place we have here,” Kelmare replied graciously. “But how is that possible?” Mario asked, touching the railing of the bed. “From the outside,” he began. “Magic,” Cristena questioned. “You mean real, honest to goodness magic?” she asked with a smile of excitement upon her face as she dipped her fingers into the sink water. ← Have You Ever Seen The Rain?